Architecture Design : Crystalline Cube is the pet project design by Kieran Timberlake. It's a 65-metre-tall, 12-storey cube building which has reflective glasses, which changes according to the weather and sunlight. The odd looking design has been built to sustain modern day security systems and to projects the emotions of openness. The sides of the buildings have been coated with a transparent film of ethylene tetrafluoroethylene (ETFE), which is similar to the ones used in their Eden Project. The cube designed building is currently sitting on an unfilled moat which surrounds the building. The designers have put up solar panels on the buildings to capture the natural light. 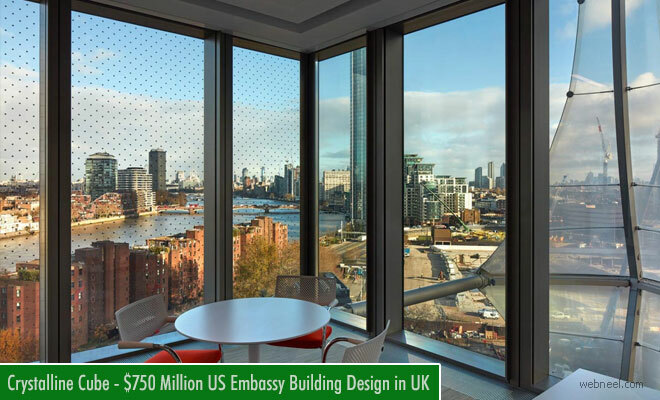 Kieran Timberlake won a competition to design the embassy which will consider all the american ideals. The new embassy will be up and and functioning in January 2018.